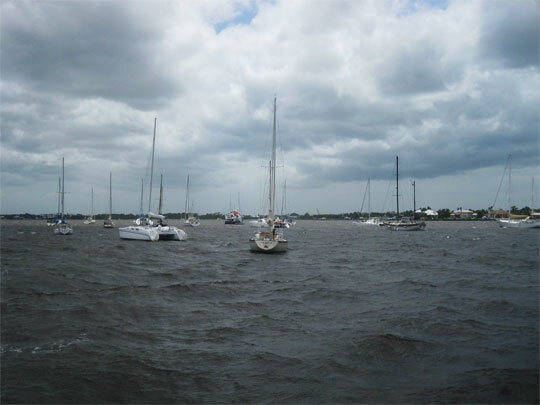 Debby's winds stir up a chop in the mooring field. Southern Florida is low, flat, and mucky. If you dig a hole two feet deep you will hit the water table, pulling up fluid as warm as that in the Gulf Stream’s current. But this underground water won’t fuel a hurricane. And even Florida’s flatlands will slow a hurricane’s winds. If a named storm hits Stuart directly, the winds should be slowed significantly by the time the time they travel 20 miles inland to the Indiantown Marina. At least, that’s what we’ll be telling ourselves for the next five months. Blue Wing has been resting on a mooring ball at Sunset Bay in Stuart for the past ten days. She can’t be happy about this. In the Bahamas she was in water so clear you could see starfish 20 feet below. Now, in the brown, brackish, tannic acid stained waters nothing is visible. Below her waterline small sea critters can be heard, eating away at her hull. She probably didn’t enjoy the passing of tropical storm Debby either. The storm went far north of Stuart, but did push some westerly winds through at about 30 mph. For a few days there was a very uncomfortable chop in the local waters. Duwan and I have been sleeping at my parents’ house each night, bargain shopping for gear each day, and riding the dinghy out most days to work on the boat. We have made some significant progress. We don’t want to spend one or two grand on a new winch. So an aft winch, previously used only for a restraining line, has been promoted to handle mainsheet and main halyard duty. We have a cleat that can be used for the restraining line. 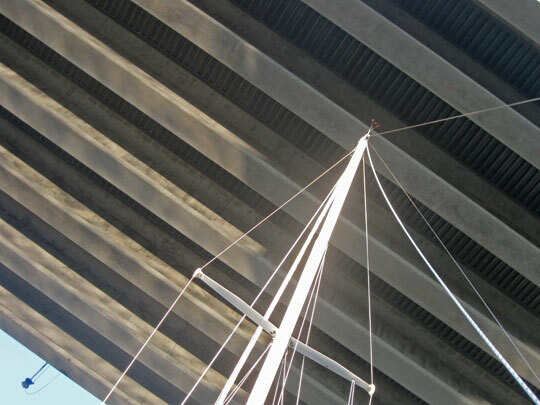 View of I-95 from below. Blue Wing is ready to head inland for a well-deserved rest before striking out on a new adventure in December. 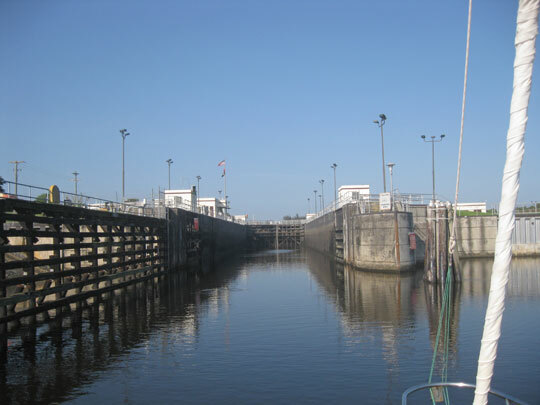 We would have taken her to Indiantown earlier, but the 63-year-old St. Lucie lock was shut down for maintenance. 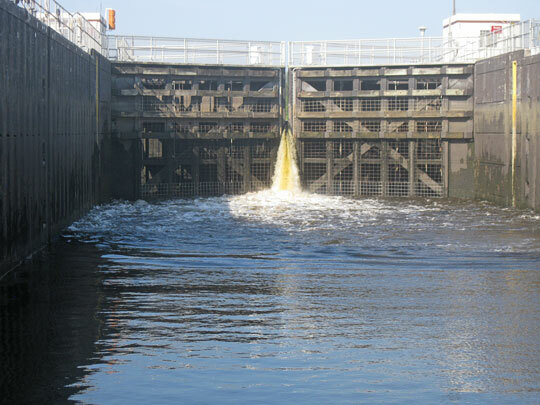 Now, on Saturday July 1st, we finally call and get a commitment that the lock will be open the next day. We wake early on Sunday the 2nd to motor towards the lock. As the lone boat arriving at 9am, we are probably the first crew to travel through after the reopening. 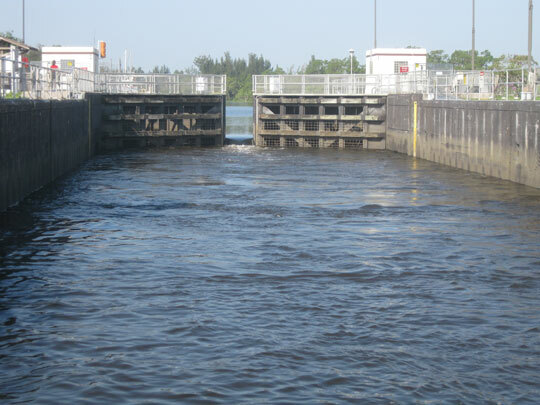 This lock is just one of a huge system that holds back the waters of Lake Okeechobee to help artificially stabilize the flow of water in the Everglades. We catch mooring lines from a guy high above us. When the western gates open the water level goes up six feet and I can chat with the mooring line guy face-to-face. He wants to know where we’ve been. He tells us a manatee traveled through the lock with us. 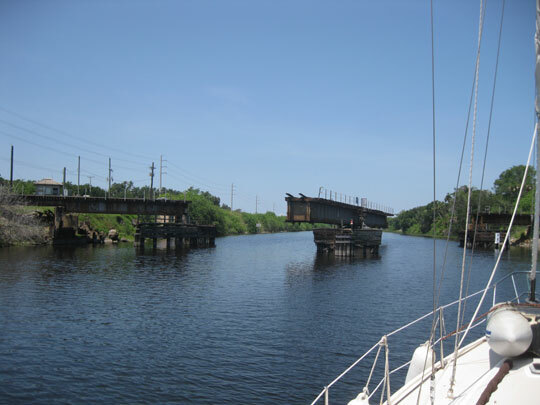 Approaching St. Lucie Lock from the east. Eastern doors of the lock close. Greg and Blue Wing in the lock. 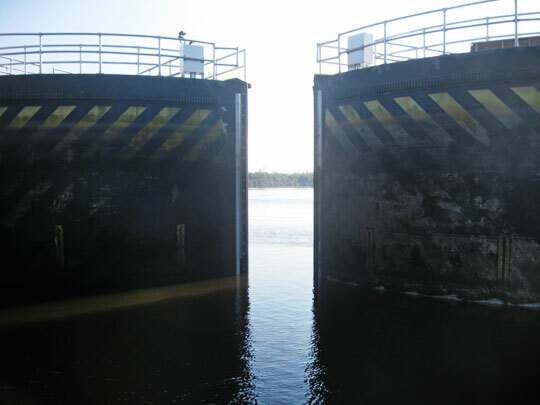 Western doors of the lock start to open. Just a few miles from the golden beaches of the Treasure Coast we see the ranches and truck farms of central Florida. The land of gated communities and password protected marina restrooms is behind us. Ahead is Indiantown, where all the bed-head school kids get free breakfast, and the Guatemalan migrants wind down from their long work days by watching movies projected against the side of the IGA grocery store. 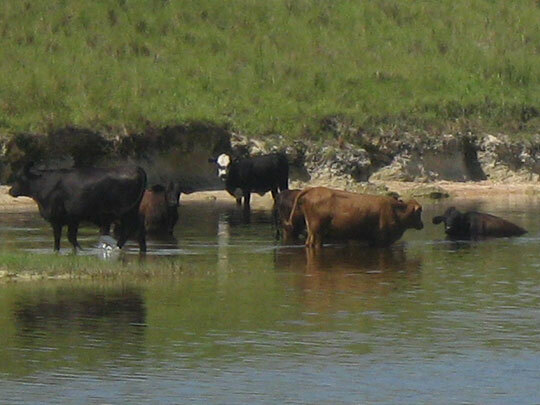 Cows chillin' in the Okeechobee Waterway. We pull into the quiet Indiantown Marina and start stripping Blue Wing of her sails, bimini, dodger, and anything else that can get torn up in high winds. More cruisers arrive. We thought that Monday would be spent walking to bus stops and riding buses. But now we have been offered a ride back to our car today. Big Bonus! CSX swing bridge opens for us. On Tuesday Blue Wing gets hauled out and put on blocks. She looks like a fish out of water. We leave her to get ready for the ride to Georgia. I’m sure Duwan is thinking about our return to Cabbagetown. I’m thinking about hanging out at the IGA with the migrant workers and asking about the best places in Guatemala to hang out during the next hurricane season. 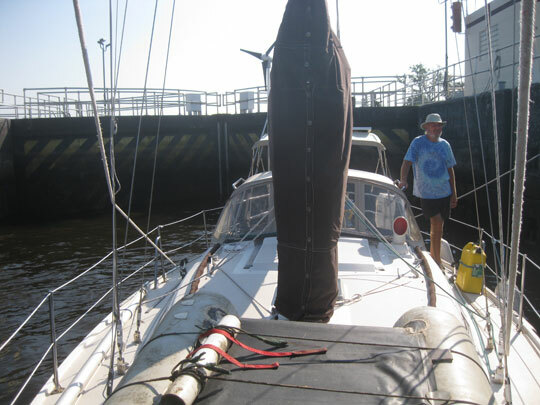 This entry was posted in Indiantown, Life on the Water and tagged Indiantown Marina. Bookmark the permalink.